Hurley and Sawyer try and solve the mystery of how Nikki & Paulo died. They discover Nikki was an actress on Expose, they find one of the Others' radios in their tent, and Sawyer finds the diamonds Nikki found in the jungle. While Sawyer's digging their grave, Sun tells him that she knows it was him that had Charlie attack her in her garden. They have a memorial service for Nikki & Paolo, and right before Hurley & Sawyer cover Nikki's face, the effects of the paralysis wear off and she opens her eyes. But nobody sees it, and they end up getting buried alive. Awesome. The others leave the barracks, and before they do they knockout Kate, Jack, and Sayid with gas, and Kate wakes up in the jungle handcuffed to Juliet. Back at the beach Hurley tells Sawyer that he needs to improve his behavior or else everyone's going to exile him from camp. While Kate and Juliet walk through the jungle, they get into a fight, which is interrupted by the appearance of the smoke monster. Sawyer tries to make nice with Claire, goes hunting with Desmond, and helps set up a boar roast with some beer for everyone. Hurley then admits that he wasn't going to be exiled, he just wanted Sawyer to do some damage control on his reputation, since people were going to be looking to him to be the leader of the group with Jack, Sayid, and Locke gone. 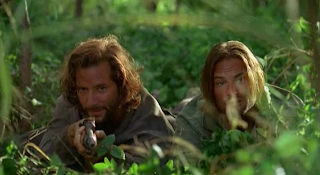 Kate and Juliet head back to the barracks to get Jack and Sayid, and the episode closes with the four of them heading back towards the beach camp. The episode runs 42:10 and is 349MB to download. You can stream the episode below (via Facebook), or go here to use torrents (better quality, recommended) to download the episodes to your computer.